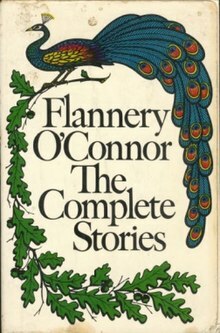 The Complete Stories is a collection of short stories by Flannery O'Connor. It was published in 1971 by Farrar, Straus and Giroux. It comprises all the stories in A Good Man Is Hard to Find and Everything That Rises Must Converge plus several previously unavailable stories. Complete Stories won the 1972 U.S. National Book Award for Fiction. Internet visitors named it the "Best of the National Book Awards" as part of the Fiction Award's 60th anniversary celebration in 2009, voting on a ballot of the best six award winners selected by writers associated with the Foundation. ^ "National Book Awards – 1972". National Book Foundation. Retrieved 2012-03-30. ^ Alice Elliott Dark, et al. "1972". 60 Years of Honoring Great American Books (book-a-day blog) July 28, 2009 . National Book Foundation. Retrieved 2012-01-25. ^ "A Celebration of the 60th National Book Awards" (2009 online poll). National Book Foundation: Awards: Best of the NBAs Fiction. Retrieved before 2012-01-25.